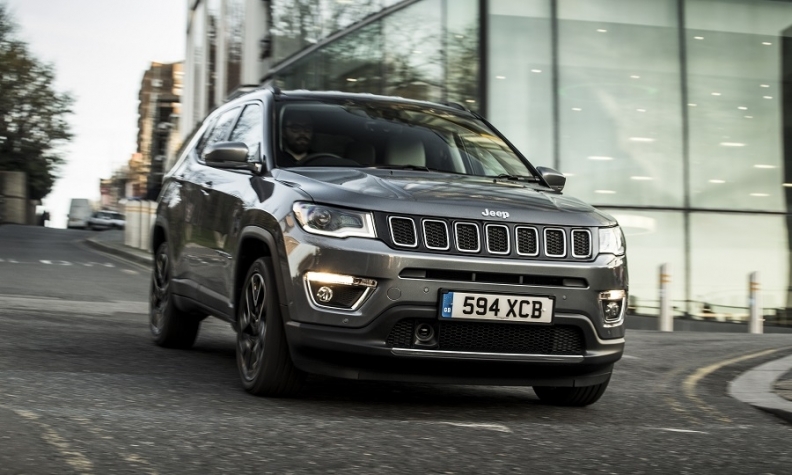 Jeep was the fastest-growing brand in Europe during the first half, led by strong demand for the new Compass. 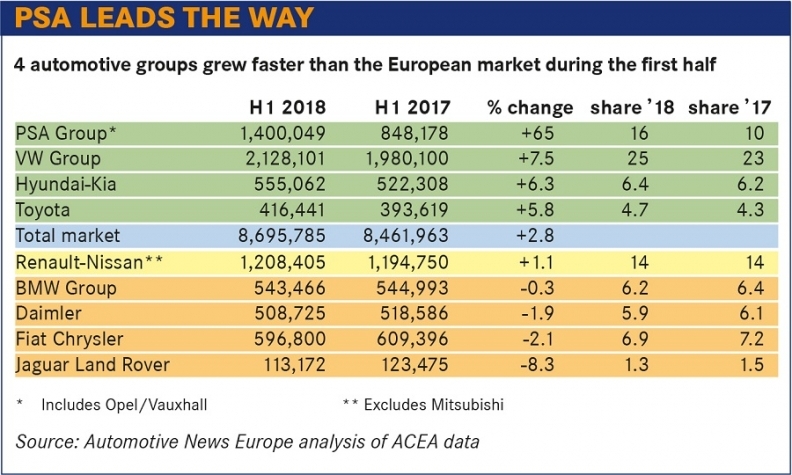 Jeep, Seat, Dacia and Volkswagen outperformed all other brands sold in Europe in the first half, as overall sales rose 2.8 percent to 8.46 million, according to industry association ACEA. The growth rate trailed 2017’s overall 3.3 percent rise, but it was higher than analysts’ and automakers’ expectations, as the European economy continued to show solid fundamentals. A 2.9 percent increase in Germany, Europe’s largest market, and a 4.7 percent rise in France, the No. 2 market, offset declines elsewhere. Sales fell 6.3 percent in the UK, the region’s No. 2 auto market, as uncertainty surrounding Brexit persisted. Sales in Italy were down 1.4 percent after growing 7.9 percent in 2017. Spanish sales continued a run of strong growth, increasing 10 percent in the first half after gaining 7.7 percent in 2017 and 11 percent in 2016. Looking ahead six to nine months, the European Union and the Organisation for Economic Co-operation and Development (OECD) are forecasting a slight easing of economic momentum, after Europe recorded its strongest growth in a decade in 2017. Real wages are rising, and unemployment continues to fall across the eurozone. However, several risks lie ahead, including a high global debt-to-GDP ratio and fallout from unilateral trade actions that could affect German brands in particular. One uncertainty in the second half is the effect of two new emissions tests, the WLTP (Worldwide harmonized Light vehicles Test Procedure) lab test and the accompanying RDE (Real Driving Emissions) on-road screening. Any model not certified under the WLTP cannot be sold after Sept. 1, although automakers can apply for an exemption of up to 10 percent of the total volumes they sold last year. This story is from Automotive News Europe's monthly magazine, which is also available to read on our iPhone and iPad apps.You can download issues by clicking here. Analysts say that automakers have started to offer generous incentives to sell non-certified cars before Sept. 1, meaning that sales in July and August, traditionally slow months, could be higher than normal. Conversely, some models have been taken off the market as they await certification, and sales this autumn could be lower than usual. “This year, I would not be surprised to see the August and September sales figures reversed,” said Stephen Latham, operations director at NFDA, the UK dealers’ association. New and updated SUV and crossover models continued to power growth at the brands that saw the largest first-half sales increases. Jeep was the fastest-growing volume brand in Europe, with sales up 68 percent to 90,297 — a gain of 36,428 sales. The increase was almost entirely due to the Compass compact SUV, which was introduced in the second half of 2017 but only gained full momentum this year. Sales also rose slightly for the Renegade, the Fiat Chrysler Automobiles subsidiary’s smallest vehicle. FCA CEO Mike Manley has ambitious plans for Jeep, which offers only SUVs and crossovers, the fastest-growing segments in Europe and globally. Manley is expecting to sell about 260,000 vehicles in Europe, the Middle East and Africa this year, compared with just 76,000 in 2014. The Compass’s sales success is partly due to the power of Jeep as an SUV brand, said Felipe Munoz, global automotive analyst at JATO Dynamics. “It’s an appealing product compared with the earlier version of the Compass,” he said, adding that the Compass was selling particularly well in Italy, FCA’s home country, which accounts for 55 percent of its sales, as well as in Spain and France. Seat, Volkswagen Group’s Spanish brand, ranked second in growth, with sales increasing by 19 percent in the first half to 253,200. The gain of 40,471 sales was driven by demand for the Arona small crossover, which was introduced last autumn. Sales rose at 20 of the 30 brands tracked by ACEA (excluding Renault’s sports-car brand, Alpine, which is new to the market in 2018). Sales fell at 10 brands, with the biggest losses at Lancia/Chrysler, down 27 percent; Land Rover, down 14 percent; Nissan, down 9.6 percent; and Fiat, down 9 percent. VW remained No. 1 among brands in unit sales. Renault, at No. 2, held steady with 631,208 sales. Third-ranked Ford declined by 3.9 percent, as sales fell to 550,672. with No. 4 Peugeot close behind after sales increased by 8.7 percent to 543,545. Overall, it was a down half for premium brands, with the exception of Volvo, which gained 7 percent, and Jaguar, which increased sales by 3.7 percent. Mercedes-Benz lost 2 percent after strong growth in 2016 and 2017, and BMW was down 1.2 percent. Audi lost 1.8 percent. Munoz said reasons for the German brands’ slowdown could be that many best-selling models such as the BMW 3 series are relatively old and that buyers are uncertain about the future of diesel engines. PSA was again Europe’s fastest-growing automotive group, but the bulk of the additional volume (65 percent) came from Opel/Vauxhall, the fifth-largest brand in Europe, which was added to the company’s sales and balance sheets on Aug. 1, 2017. PSA’s first-half market share was 16 percent on sales of 1,400,049 cars, compared with 10 percent in 2017. VW Group surged 7.5 percent overall to 2,128,101 sales, gaining 1.1 points of market share to 24.5 percent. Other groups outpacing the market were Hyundai-Kia (6.3 percent), Toyota (5.8 percent) and Renault (5 percent).